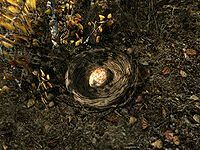 Pine Thrush Eggs can be harvested from birds' nests that are found in forested regions, notably throughout The Rift. Rock warbler nests (yielding rock warbler eggs) are named identically to pine thrush ones ("Birds' Nest"), but are more common in rocky regions. It is categorized as a common ingredient, meaning that all apothecary merchants have a 36% chance of carrying 1-5 samples. In addition, it may be randomly found in some barrels and in apothecary's satchels. Pine thrush eggs are also categorized as food, meaning they can be sold to innkeepers as well as apothecary merchants. This page was last modified on 9 April 2018, at 05:59.